On April 17, 2015, a Physical Marathon Festival took place in Troitsk. Starting a few months prior to the competition, each team participating in the marathon, guided by the scientists from the research institutes, has been developing and manufacturing a working model showing a physical phenomenon or the way a certain piece of equipment is applied. The final stage of the competition included a presentation and defense of the project on the stage of the local School of Arts. On January 19, 2015, Pavel B. Sorokin was awarded the European Academy Award in the main building of Moscow State University. Academician V.P. Skulachev, President of the Russian Members Club of the European Academy presented the award. January 17, 2015. Moscow. Troitsk. On January 17, 2015 the city of Troitsk was visited by Oleg E. Bocharov - the Head of the Department of Science, Industrial Policy and Entrepreneurship of Moscow and Benjamin Shaevich Kaganov - the Deputy Minister of Education and Science of the Russian Federation. The delegation was also attended by Dmitry Nabokin - the Prefect of Administrative District of Troitsk and New Moscow (TINAO), Vladimir E. Dudochkin - the Head of the city district of Troitsk (Moscow) and other officials. On December 3, 2014, Pavel B. Sorokin successfully defended the degree of Doctor of physical and mathematical sciences in a Condensed matter physics field. The defence took place at the Scientific Research Institute of Physics and Chemistry named after L. Karpov. The thesis was entitled "Theoretical study of physical and chemical properties of low-dimensional structures". "Modification of the boundaries of nanostructured SiGe-thermoelectrics," by Danil A. Ovsyannikov, a graduate student of TISNCM, and "Measurement of the tribological properties of coatings and composite materials at the submicron and nanometer scale," by Konstantin S. Kravchuk, a graduate student of SU MISA. November 5 - 8, 2014, Moscow. Troitsk. From November 5 to 8, 2014, the ninth international conference "Carbon: fundamental problems of science, materials, technology" was held in the city of Troitsk, the district of Moscow, located at 12 Oktyabrsky pr. June 25 and July 02, 2014. Moscow. Troitsk. On June 25 and on July 02, 2014, the fourth bachelor’s and master’s degree defense took place at the Chair of Physics and Chemistry of Nanostructures. All students passed with excellent results. January 23, 2014. Moscow. Troitsk. On October 02 - 03, 2013, FSBI TISNCM and other companies held a Seminar for young scientists of the Central Region in Andreevka village, Moscow region. The theme of the Seminar was: "The Participation of Young Scientists in Fundamental and Applied Research and Development of the New Carbon and Nanocarbon Materials". October 02 - 03, 2013. Zelenograd. September 24 - 25, 2013. Moscow. On September 24-25 the scientific conference and exhibition dedicated to the results of realization of the Federal Target Program “Research and development of priority areas of science and technology in Russia in 2007 - 2013” was held by the Ministry of Education and Science of the Russian Federation in the National University of Science and Technology MISiS. May 22, 2013. Troitsk, Moscow. 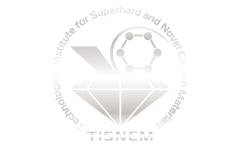 On May 22, 2013, Dr. G. Brian Stephenson (Argonne National Laboratory) and Dr. Aymeric Robert (SLAC National Accelerator Laboratory) paid a working visit to the Technological Institute for Superhard and Novel Carbon Materials (FSBI TISNCM). April 26, 2013. Troitsk, Moscow. On April 26, 2013, FSBI TISNCM staff took part in a clean-up work party on the territory of the institute. April 25 – 27, 2013. Moscow. On April 25 – 27, 2013, the exhibition, based on the results of the Federal Target Program “Research and Development of Science and Technology Complex priority areas of Russian Federation in 2007-2013” was held in the exhibition center “Forum Hall” in Moscow. April 19, 2013. Troitsk, Moscow. On April 19, 2013, an introductory tour with following interview for third-year students of the Moscow Institute of Physics and Technology (State University) was given in the FSBI TISNCM. Students learned about work of Laboratories of Spectral research, Electron microscopy, Nanostructured Metal-carbon Materials, CVD diamond Growth, and also visited the Department of Chemical Technologies and Nanomaterials. On April 5, 2013, FSBI TISNCM hosted the Russian-American Presidential Commission working group representing the departments and laboratories from the USA. The visit was focused on discussing the cooperation issues within the international agreements and familiarization with the scientific equipment and achievements of the Technological Institute for Superhard and Novel Carbon Materials. September 25 – 28, 2012. Troitsk. On September 25-28, 2012, in the heart of New Moscow, the city of Troitsk, the 8th International Conference took place, presenting the latest developments in the study of the carbon properties and its use in various branches of science. September 17 – 21, 2012. Havana. The 4th International Nanoscience and Nanotechnology Seminar was held on September 17 – 21, 2012, in Havana, the capital of the Republic of Cuba. The seminar was attended by over 150 participants (including people from the U.S., Japan, China, Vietnam, Serbia, Venezuela and other Latin American countries), and in total there were 90 oral presentations and 70 posters (www.seminarionanotecnologiascuba.com). On June 20, 2012, there was a second Master’s degree defense at the Physics and Chemistry of Nanostructures Chair. All the graduates passed the examination with excellent results. Congratulations and best wishes! April 17 – 19, 2012. Moscow. The exhibition “Expo Control 2012” was held as a part of “Russia Innovational 2012” week, which is conducted by direct participation of the Chamber of Commerce and Industry of Russia. This specialized exhibition was dedicated to three most important and essential steps of every industrial production and technological process – Control, Tests and Measurements. President of Russia Dmitry Medvedev featuring Mayor of Moscow Sergey Sobyanin approved the List of Orders for the federal and regional authorities as a result of Meeting for Moscow agglomeration development, that took place on April 9, 2012 in the city of Troitsk (neighboring with Moscow), - was reported by the press office of the President. For the first time the Qualification State Exam was taken by the second year Masters on the subject of ”Physics and Chemistry of Nanostructures”. The event was held with the support of the Federal Agency of Technical regulation and Metrology, Russian Academy of Science, Russian Engineering Academy, certain ministries and agencies and Analytical Centers Association “Analytics”. IV International Nanotechnology Forum has been completed. Within three days of the Forum, almost 6,5 thousand people took part in this event. 2 августа 2011 года. Троицк. "Технологический институт сверхтвердых и новых углеродных материалов"
On June 23, 2011, there was the third degree defense of Bachelor's of FSBI TISNCM – Anisimov A., Buraranova Y., Golovanova A., Zameshina A., Maslenikova I., Telichko A. Congratulations! On June 9, 2011 there was the First Masters degree defense - for Ms. T. Ivanova and Ms. D. Ovchinnikova. Congratulations and great success in the future research! On May 12-15, 2011, the exhibition “Science, technology and innovation achievements of Russia”. – the main event of the Year of Russia in Spain - was held in the exhibition hall “Feria de Madrid” (in Madrid, Spain). And as a part of this exhibition, 244 Russian companies presented their latest scientific, technological and innovative projects. From the New year 2011 (from January 01, 2011) we have new telephone numbers! Tel +7 (495) 330-99-25 and Fax+7 (495) 330-99-60 will be disconnected! On November 22-23, 2010, in accordance with the event plan of the Ministry of Education and Science of the Russian Federation, the exhibition and seminar “NOVEL NANOSTRUCTURED AND CARBON-BASED MATERIALS FOR APPLICATIONS” was held in the Instituto de Ciencia de Materiales de Madrid, on the basis of the Russian Center of Science and Culture of Madrid (Spain). On November 17-19, 2010, 7th international conference “Carbon: fundamental Problems of Science, Materials Engineering, Technology. Structural and Functional Materials (including nanomaterials) and technology of their production” was held in Suzdal. November 7 – 9, 2010. Al-Kuwait. In the capital of Kuwait, the city of Al-Kuwait, the Third International Invention Fair of the Middle East IIFME-2010 took place. The Fair was organized by the Kuwait Science Club (KSC) in collaboration with the International Geneva Convention and support from His Highness the Amir Sheikh Sabah Al Ahmad Al Jaber Al Sabah. On November 1-3, 2010, the III International Nanotechnology Forum RUSNANOTECH 2010 was held in the Expocentre on Krasnaya presnya street in Moscow. The Forum program consisted of a business part and Science and Technology sections. World well known scientists, heads of the largest companies and famous politicians took part at this Forum. On April 19-22, 2010, 11-th International Forum “Hich-Tech XXI” – “BT XXI 2010” was held in the Expocentre in Moscow. FSBI TISNCM celebrates its 15th anniversary! On March 19, 2010, TISNCM hosted a ceremonial meeting of the Academic Council dedicated to the 15th anniversary of the establishment of the Institute. This enlarged meeting of the Academic Council gathered both TISNCM staff and some honored guests: the head of the city of Troitsk V. Sidnev, representatives of the city’s Administration and the Board of Deputies, the directors of the scientific institutes, representatives of the research institutes and companies, Federal Agency for Science and Innovation (Rosnauka) and other organizations. March 17 – 19, 2010. Moscow. The 7th International Exhibition Expocoating 2010 – Coatings and Surface treatment, took place on March 17-19, 2010, in Moscow (Olympiisky SC). At the booth of TISNCM scanning nano-hardness testers were presented – NanoScan-Compact and NanoScan-Mini. October 28 – 30, 2009. Troitsk. The Forum program consisted of a business part and Science & Technology sections. As a part of the Forum there was an exhibition of the newest developments in the field of nanotechnology. FSBI TISNCM took part in the exhibition and presented their scanning probe of nano-hardness “NanoScan-3D”, developed and produced in the Department of Physical and Mechanical Properties Research. Among the 118 exhibition booths, more than 300 companies from 17 countries presented their expositions. Also, exhibits of the Department of Physical and Mechanical Properties Research and the Department of Single-Crystal Growth were presented on the new exhibition booth of ROSNAUKA. NanoScan device became a prizewinner of the Russian Youth Prize in the field of nanotechnology. 685 participants from 36 countries all over the world took part in the business program and Science & Technology sections of the Forum. October 4 – 10, 2009. Athens. The Ministry of Education and Science of the Russian Federation has issued a Consolidated Plan for the Information Management of the Russian Centre of Science and Culture (RCSC) abroad; it schedules that from October 4 - 10, 2009, the RCSC in Athens (Greece) will be holding an exhibition-seminar "Nanotechnologies. New and nanostructured carbon materials". 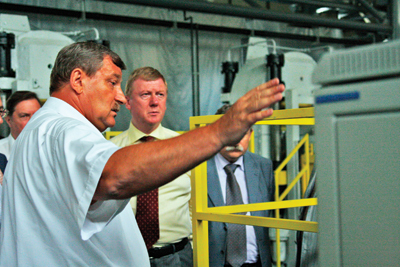 On July 29, 2009 (Wed), delegation of Rosnano paid a visit to the city of Trotsk - the Science City, situated near Moscow. The delegation was headed by CEO of the State Corporation – Mr. Anatoly B. Chubais. And the event was hosted by Administration of the city, Science Center of Russian Academy of Science in Ttroitsk and “Russian Techno Parks” Ltd.
On the meeting in the House of Scientists, the Head of the city – Mr. Victor Sidnev - was telling in details about historical roots and beneficial aspects of geographic location of Troitsk. This lovely city with population of 36 thousand people is located only 20 kilometers from Moscow. In 2007 Troitsk became a Scince City. There are 11 science institutes, that work in a very different areas of research. There are Institute of nuclear Research RAS, Troitsk Institute for Innovation and Fusion Research (TRINITI), Technological Institute for Superhard and Novel Carbon materials (TISNCM), and also Shared-Use Equipment centers, Business Incubator, and other scientific and technological institutions among them. June 8 – 12, 2009. Helsinki. Ministry of education and science of Russia, FSBI TISNCM and Russian Scientific and Cultural Centre in Helsinki are organizing seminar-exhibition “Novel nanostructured and carbon materials in sensor technique” to support and consolidate scientific and technological cooperation between Finland and Russia. The aim of the upcoming seminar-exhibition is to show some technological developments of leading Russian research and technological organizations in modern materials.